The Vinten Vantage compact robotic head is the only lightweight robotic head that provides our customers with unmatched flexibility in the studio. From smooth on-air motion to being camera and lens agnostic, the Vinten Vantage is a clear upgrade from the traditional PTZ solution since it uniquely enables the user to choose the best camera and lens for their application without limitations. With cost effective pricing, this robotic head allows our users the option to purchase more units for multiple shooting angles - all within budget. The Vinten Vantage enables you to quickly add another compact robotic head to your existing installation with accurate colour reproduction, for example as a single point of view camera in the ceiling. And as studios are becoming more versatile in their layout, or alternative spaces used, such as regional bureaus, then Vinten Vantage offers a flexible and affordable solution, which fits into your IP workflow. THe Vinten Vantage offers the opportunity to discreetly position compact robotic heads which have high repeatability and accuracy of movement to consistently capture the action. The Vinten Vantage is compact, unobtrusive, and quiet – with smooth motion control - perfect for concert halls. With the combination of high image quality, virtually silent movement, and zooming functionality you can discreetly capture all the detail of the event, as well as audience shots. The Vinten Vantage has continuous movement across all axes enabling perfect control when following the dynamic nature of outside broadcast, sport or live events. Cameras can be located in a variety of positions, compared to conventional shooting, to ensure a unique viewpoint. The Vinten Vantage enables you to quickly add another compact robotic head to your existing installation with accurate colour reproduction, for example as a single point of view camera in the ceiling. And as studios are becoming more versatile in their layout, or alternative spaces used, such as regional bureaus, then the Vinten Vantage offers a flexible and affordable solution, which fits into your IP workflow. "The μVRC has made it really simple to have everything ready to go, I hit one button and go right to the shot I am looking for." "The [Vinten] Vantage Robotic Heads are very smooth, they're very quick to find the exact position that I am looking for." Innovative design discreetly fits within your studio environment. With a weight of 2.2Kg, it can be mounted on any flat base tripod or 75mm bowl tripod with the optional bowl adapter. Fits your workflow and compatible with serial, Ethernet, Lanc. Supports a wide range of pro-video camcorders and lens, allowing the user to select the best equipment for their application needs. Supports servo lenses which are easy to use and allows for improved image quality or alternatively manual lenses which are more cost effective. This cost-effective, modular version of Vinten's high-end HD-VRC software allows small studios to leverage the award-winning Vinten Vantage compact robotic head for unmatched flexibility in content creation and broadcast-quality movement and control. Utilising an easy to use PC control and USB Joystick the μVRC is the perfect companion to the Vinten Vantage, and can control multiple units for various shooting angles - all within budget. Superior broadcast-quality, motion control at a price suits your budget. Option is expand functionality based on specific needs and budget. Complete with easy-to-read touchscreen and easy-to-use USB joystick panel. Access to camera select, pre-set shots, essential shading, playback and more. Video switcher integration that easily connects with third-party switchers. Auto-discovery setting enables a quick setup of robotic devices. If users require control of five or more heads, have studios with a significant number of robotic systems, or need control over all axes (pan, tilt, zoom, focus, elevation, and XY), then Vinten's complete HDVRC control system is an easy-to-configure control solution that provides multi-user, multi-facility control of pedestals, heads and elevation units. 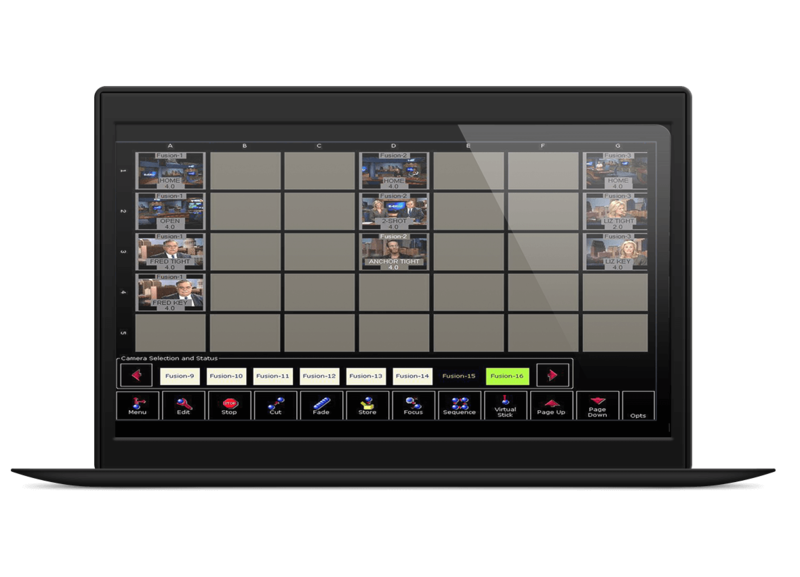 The Windows based touchscreen user interface allows a single controller for multiple devices / studios within the same network. Supports SD/SDI and HD video signals and graphics capture consistent with HD signals on other broadcast equipment. Image storage of all axes in easy one-touch operation. System interconnection is via industry standard TCP/IP, RS232 and RS422 protocols. Compatible with Serial, Ethernet, and Lanc. Do you want to set up a demo or have questions about the Vinten Vantage? Fill out the form and a representative will get back to you as soon as possible! Bridge House, Heron Square, Richmond, TW9 1EN, United Kingdom. Do you want to set up a demo or have questions about the Vinten Vantage? Fill out the form and a representative will get back to you as soon as possible!